At 11:46 a.m. local time today, a magnitude-7.2 earthquake shook Japan, according to the U.S. Geological Survey (USGS). 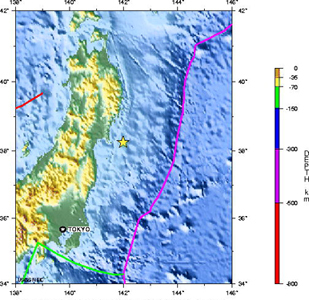 The shaking originated 52.7 kilometers below sea level, off the eastern Japanese coast, about 95 kilometers east of Honshu and 350 kilometers northeast of Tokyo. The star denotes the epicenter of the magnitude-7.2 earthquake that occurred today off the coast of Japan. Colored lines mark the major tectonic boundaries: purple traces the Pacific Plate, green traces the Philippine Plate, and both border the Eurasian Plate to the west. Image is courtesy of USGS. Most of the 59 people reportedly injured were hurt when debris fell on a crowded public pool in Sendai, Japan, according to an Associated Press (AP) report. Landslides and two 4-inch-high tsunamis were also reported in the region, but according to USGS, no tsunami warnings have been issued. Damage included power outages to 17,000 homes and suspended train and airline service. However, the offshore location of the epicenter may have limited the damage, AP reports. Japan is located at the juncture of the North American, Eurasian, Pacific, and Philippine plates, which cause a high frequency of earthquakes. USGS reports that the last significant earthquake to hit Japan was a magnitude-6.0 trembler July 23, 25 kilometers south of Tokyo, although smaller magnitude-4 and 5 events have been shaking the region this month.